From the moment astronomers first began finding planets around other stars in the mid-1990s, they realized that their scientific imaginations had been far too tame. Everyone assumed that alien solar systems would resemble ours, with small, rocky planets like Mars and Earth closer to the center and big, gaseous blobs like Jupiter and Saturn farther out. But with the discovery of new exoplanets, as they're now known, astronomers began to toss their assumptions out the window. Everywhere they looked, they saw big, gaseous planets that orbited closer to their stars than anyone had thought possible  closer even than our own scorched Mercury. By now, the existence of these so-called hot Jupiters is no longer big news. Instead, it's the color of one new discovery that has startled scientists. If you imagine the blackest thing you've ever heard of  a lump of coal, say  and then try to imagine something a whole lot blacker, you're beginning to get a sense of the planet known by the strange name of TrES-2b. Whereas the original Jupiter reflects about 50% of the sunlight that hits it, TrES-2b reflects an infinitesimal 1%. "Actually," says David Spiegel, a Princeton astronomer who co-authored the new study on TrES-2b's remarkable blackness that appears in Monthly Notices of the Royal Astronomical Society, "our best models suggest it's more like a 10th of a percent." Still, the craziest thing about this discovery is that it may not be all that crazy. 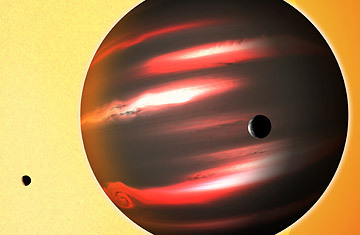 Astronomers have long suspected that hot Jupiters should be relatively dark. The real Jupiter has an atmosphere made up mostly of hydrogen gas, with light-reflecting clouds of frozen ammonia and various other substances. TrES-2b is mostly hydrogen as well, but since it's only 3 million miles from its star  more than 160 times closer than Jupiter is to the sun  TrES-2b simmers at a toasty 1,800 degrees. At those temperatures, things like sodium and potassium, which would otherwise be solid, evaporate to form gases  gases that are then spread very thin. For every molecule of potassium or sodium, the atmosphere has a million atoms of hydrogen. But these molecules are so efficient at absorbing light that even under the intense glare of the nearby star, the planet reflects much less light than you'd expect. It does, however, glow, which is how the astronomers made their new discovery in the first place. From the vantage point of Earth, TrES-2b's orbit takes it right in front of its star, then behind, then in front again, over and over. When the planet is about to duck behind the star, its day side faces us, so whatever light we're seeing is a combination of planetary light and starlight. When it's about to pass in front, we're seeing the planet's night side, so all we're seeing is the star. By comparing the two, Spiegel and his co-author, Harvard astronomer David Kipping, determined how much light the planet alone was contributing. (It was six one-millionths of the overall light, if you're keeping count.) And virtually all of that light could be accounted for by the 1,800-degree atmosphere, glowing like a hot coal. The greatest mystery of TrES-2b is that, given what astronomers think they understand about hot Jupiters, there shouldn't be enough potassium or sodium to make this particular planet as black as it appears to be. "There could be an overabundance of them," says Spiegel, "or there could be some other molecules involved, such as titanium oxide, but it would be hard to get that into the upper atmosphere. It really is a mystery." Solving that broader mystery will have to wait for a more detailed study of TrES-2b's glow  and that, says Kipping, will probably require the James Webb Space Telescope, the Hubble's successor, which is now under construction. Unfortunately, it's way over budget and behind schedule, and just last month a congressional subcommittee threatened to kill the project altogether. If that threat holds up, the blackest thing this side of a black hole may go unexplained for a very long time. See amazing photos of the sun. See TIME's special on the 40th anniversary of the moon landing.